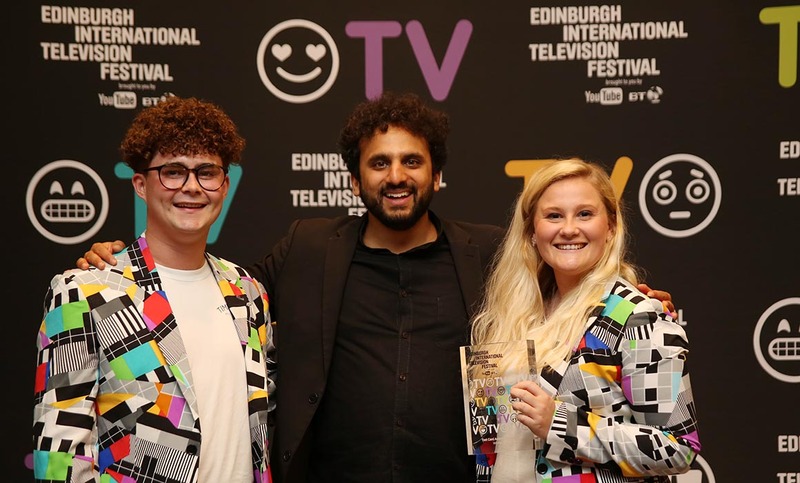 Middlesex University television production graduates Joshua Goode and Madelen Nygaard won top prize in the Test Card ‘Unscripted’ category at the prestigious Edinburgh International Television Festival for their original TV show, The Switch. The pair beat over 2,000 other hopefuls to scoop the award, which they hope will give them the opportunity to compete with established shows like The Voice and Britain’s Got Talent. The Switch challenges two musicians – with distinctly different musical styles – to take each others’ lyrics and create a new tune around them in their own style. The show is unique because it isn’t a competition – there are no judges or voting. This is not the first award Joshua and Madelen have won for The Switch – the show was also “highly commended” runner-up in the University’s TV Production Awards at the British Film Institute this summer. Joshua is pleased the show has gained early recognition. “Perseverance, passion and belief have been key elements to the success of our show, things that will influence everything I do going forward,” he says. “The show’s lack of competition was a cause for concern but we took the risk and changed the opinions of all our critics. Madelen - the show’s director – has learnt a lot from the project, especially when it comes to handling critics. “We knew the concept for The Switch was something special, we just had to prove it to everyone else.